Unbounce Review: Is it the best landing page builder? Landing pages have always been tricky for us here at Venture Harbour. Our developers are normally busy with building new products and optimising our existing ones but our marketing team needs landing pages built regularly and quickly – they don’t want to be waiting for a few weeks while each one is designed and developed for them. Building landing pages is only half of the battle, though. Running split tests and optimising every page on an ongoing basis is a real challenge and we’ve tried multiple landing page builders to solve this problem for us. Most recently, we’ve been using Unbounce to aid the release of our latest venture, Serene, and we thought it might help to share our experience as an in-depth review/case study. What are we looking at in this Unbounce review? Our main goal with this review is to give you a real impression of what it’s like to use Unbounce as a landing page builder and optimisation tool. First, I’m going to explain why we started using Unbounce and then I’ll run through the pros and cons we experienced along the way. But the main bulk of this review is going to be more like a case study, showing you what we’ve actually done with the platform, the problems it solved for us and what could be improved. This will give you working examples of what Unbounce can do for your business and idea of what kind of issues you come across. No marketing tool is perfect and only you can decide what the dealbreakers are for your own needs. This review will help you decide whether Unbounce is the landing page builder for you. Why did we start using Unbounce? Essentially, landing pages were holding back our efforts to release and promote new products. With our development team pumping all of its resources into getting ready for launch, the task of designing and developing the landing pages for our marketing team upon request isn’t manageable. Once our marketing team comes up with campaign ideas, it needs landing pages quickly – it can’t wait weeks for them to be designed and developed, one by one. We can need multiple landing pages at any one time, too, for different products, new websites, PPC campaigns, email marketing campaigns and all kinds of purposes. Being able to create these quickly is a major attraction of landing page builders like Unbounce. Your first landing page design never gets the best results. To maximise performance, you need to optimise/test on an ongoing basis and this means you’re essentially creating multiple variations for every landing page you build. This only makes development and time constraints more difficult. We knew that Unbounce comes with unlimited A/B testing on all of its plans and we wanted to see if this, combined with its landing page builder, would be enough for us to create and optimise our pages using a single platform. Another feature that caught our attention was Dynamic Text Replacement, which promises to make personalisation fast and easy to implement. Leadpages and Instapage also caught our attention in the quest for a landing page builder but neither option quite worked out for us and the feedback we were getting from Unbounce users was consistently better than the other options. You can read our Leadpages review here but the quick answer is its landing page builder wasn’t as good as the alternatives and it lacked enough customisation options and testing features for our needs. Overall, Unbounce is a great piece of software and there are plenty of good things to say about. There’s always room for improvement, though, and here are the pros and cons we’ve experienced while using the platform. I’m not going to lie – some of those cons added a lot of initial extra work but you’ll end up with the same problems on most landing page builders like Instapage and Leadpages. If Unbounce opens up the platform to split test landing pages previously built outside of the software, this would be a huge win and the ability to add custom classes to buttons would save a lot of time as well. Overall, Unbounce is going to save you way more time than it costs and, once you’re up and running with the platform, it’s pretty hard to do without. The landing page builder is great, the templates available are excellent and you get a lot of freedom to customise your pages. Unbounce’s split testing features are solid, too. Sure, they’re not as extensive as a dedicated piece of A/B testing software but it’s a strong offering for a landing page builder and more than you’ll get from most alternatives. Now, let’s get into the nitty gritty of what it’s like to actually use Unbounce as a landing page builder and optimisation tool. 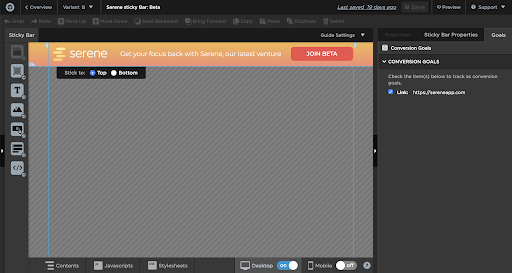 Our first task with Unbounce was to create a “coming soon” page for the Serene app. You can either start with a blank page and build your own landing page from scratch, use the Training Template as a general guide or choose a template and customise it to your needs. 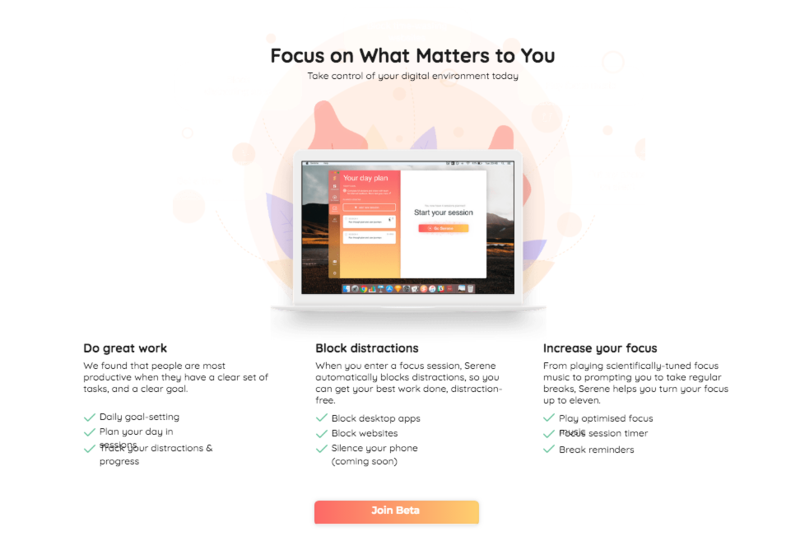 We wanted to generate leads for Serene before we launched the product live so we chose a minimal template with an email signup form and adjusted the design to suit the concept of a productivity app. In colour psychology, orange is associated with energy and this is the feeling we want to leave our users with, so we opted for a gradient from red to yellow – a combination that draws attention (think traffic signs), signifies importance and gets people excited. Unbounce’s landing page builder makes it incredibly easy to put your own designs on its templates with a lot more freedom than you may be used to with other platforms. In terms of actually building our first landing page, we were done in a matter of minutes – and there’s no reason it should take you ay longer, as long as you know what you want to create before starting. If you’re running a WordPress website, the first integration you’ll need to think about is publishing your pages through the CMS. This was actually a lot easier than we anticipated and the only prepwork you need to do is download the Unbounce plugin to verify your site. Once this is done, head back to the Unbounce dashboard and the landing page you want to publish. Simply define your URL (and make sure it is the correct URL) you want to publish to and that’s it. Unlike WordPress, integrating Unbounce with our CMS ActiveCampaign wasn’t as straightforward as we had hoped. It turned out this was because ActiveCampaign has updated its interface and Unbounce hasn’t updated its documentation to match. In the end, we ended up using Zapier to integrate the platforms and this actually worked out better for us. 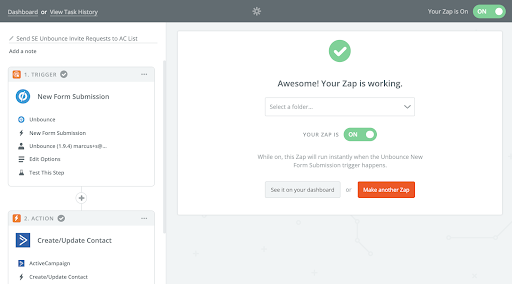 Unbounce’s native integration with ActiveCampaign only sends over the name and email of users but we created a Zap to send over additional data. I have to say, I would recommend this approach if you’re using Unbounce and ActiveCampaign. Unbounce offers unlimited A/B testing on all versions of its platform and this was a key feature that drew us to its software. Otherwise known as split testing, this allows you to create multiple versions of the same landing page and pit them against each other. 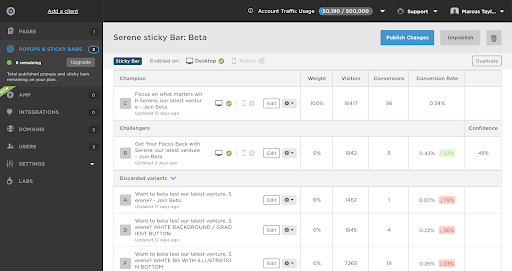 Traffic will be split between each version and you can keep track of progress in the Unbounce dashboard. All in all, A/B testing on Unbounce works really well and it simplifies the entire process nicely. You don’t need any technical expertise whatsoever and our marketing team is able to create variations and run tests without any input from our development team whatsoever. The only problem we had with A/B testing on Unbounce is that we couldn’t apply it to existing landing pages we’d already created outside of Unbounce. This is standard procedure with landing page builders like this but more extensive optimisation platforms like VWO and Google Optimize do provide this. We’ve experimented quite a lot with popups and sticky bars over the years and this is something we wanted to continue with our Serene landing pages. Once again, Unbounce’s drag and drop editor makes it a breeze to create and customise these. Once you’ve designed your popup or sticky bar, you can choose when to trigger them, add them to any page on your website (not only Unbounce landing pages), set custom frequencies and schedule them to only appear at certain times. That gives you a lot of deliverability options and you can monitor performance from your Unbounce dashboard to see how they’re impacting conversion rates. Compared to dedicated popup platforms like OptinMonster, Unbounce doesn’t give you a dozen different types of popups to work with but I’m not convinced this is an issue. More important for us was Unbounce’s Dynamic Text Replacement feature that allows us to adapt the content of our popups and landing pages to match the search terms users type into Google before landing on our site. After using Unbounce throughout the launch process of Serene, I have no reservations about recommending it as a landing page builder. It’s certainly the best platforms of its type that I’ve used and I don’t think anyone else on our team is going to disagree with that. There are some minor niggles that add unnecessary work, particularly when you’re first getting started and it would be nice to have some better integrations with Google Analytics. However, Unbounce solves far more problems than it creates and I think it’s safe to say this is still the best landing page builder on the market. We were pretty demanding in the way we used this platform and any problems we came across were fixed with integrations or a few tweaks. To sum up: if you’re on the hunt for a landing page builder, start with Unbounce.